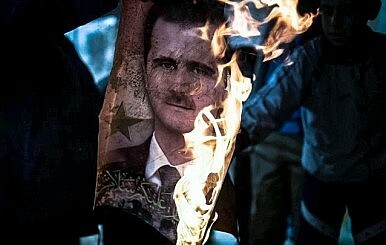 The groups circling for if the Assad regime falls are no solution to the country’s problems. The U.S. and EU should steer clear, Indian Decade contributor Madhav Nalapat writes from Syria. Even in Dubai, as I’m waiting to catch a flight to Damascus, it’s clear that the Gulf Cooperation Council monarchies have adopted a strategy of constricting Syria in such a way that the Assad regime falls. An Emirates Airlines desk dealing with the issue of 96-hour transit visas for those wanting a stopover in Dubai advised me that while citizens of India could take advantage of the facility, those from Syria could not. A media delegation from Delhi had to spend the night in the airport waiting room, apparently because the Syrian Tourism Ministry’s request for overnight accommodation was denied at the last minute, when the group was already airborne from Delhi. Even the airport money changers have been co-opted into the strategy, with many no longer exchanging other currencies for Syrian pounds. Several international credit cards have reportedly ceased to work in Syria, while international flights to and from its cities have been reduced to a trickle. It’s small wonder that tourist arrivals have plunged. Almost all European and allied states have issued advisories to their citizens against travelling to Syria and, as a consequence, even getting insured for the visit is proving a problem. Trying to make Syria tourist friendly had been one the most visible of Bashar Assad’s modest reforms since taking over from his father Hafez a decade ago. Damascus, Aleppo and other cities have been spruced up, with new hotels and diversions that include clubs for the weary and the adventurous to while away the hours in. The country can also boast a visible history dating back millennia, and in location after location there are the physical signs of past greatness, most notably the Roman ruins near Sweida and Shahba. About 10 percent of Syria’s 24 million people are Christian, while Shia (including the Assad family) account for 12 percent. But it’s the rule by a Shiite family of a country that has a Sunni majority that seems to have impelled Qatar, Turkey and Saudi Arabia to join hands with the United States and the EU in seeking regime change in Damascus. In the case of the U.S. and the EU, the target is really Iran, with Syria being the low-hanging fruit that needs to be harvested before turning the full attention of the alliance on Tehran. It was Mahatma Gandhi who said that “means are, after all, everything.” And it is the means now being employed by the Ankara-Doha-Riyadh trio to prize Syria loose from the Assads that may create immense headaches in the future, both for themselves and for their friends. Since mid-2011, the three have reportedly been assisting both financially and logistically any group in Syria that seeks the overthrow of Assad. This includes those who seek the fall of any stable governance structure because of their links to organized crime and terrorism. By not discriminating between such elements (some of which have links to the narcotics trade) and those seeking political change for reasons of ethics and ideology, the trio are empowering disparate groups of individuals as impossible to control as many of the armed gangs that have created their own fiefs in Libya.